Whether playing classical viola with the Chamber Music Society of Lincoln Center, Texas fiddle with The Doc Wallace Trio, electric violin at heavy-metal shows, or contemporary compositions with his flute-viola-harp trio, Hat Trick, David Wallace is at home in front of an audience. 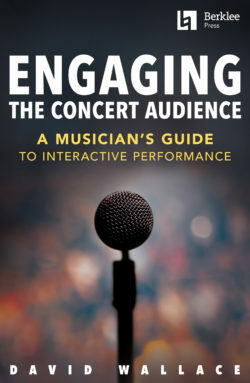 Around the globe, musicians have widely adopted his groundbreaking approaches to audience engagement and interactive performance. David’s broadcast credits include NPR, PBS, KTV (Korea), Tokyo MX, WQXR, CBS, and ABC. He has recorded for Bridge Records, Inc., BIS Records, Innova Recordings, Tzadik Records, Resonance Records, and Mulatta Records. An award-winning composer, David’s commissions for original compositions and arrangements include the New York Philharmonic, Carnegie Hall, Suntory Hall, the Marian Anderson String Quartet, and violinist Rachel Barton Pine. 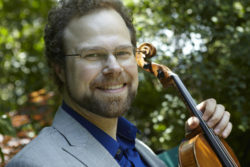 As a teaching artist, David has worked for dozens of arts organizations, including Young Audiences, Lincoln Center Education, and big five orchestras. In 2002, David’s numerous creative contributions were honored with the first McGraw-Hill Companies’ Robert Sherman Award for Music Education and Community Outreach, honoring musicians who have distinguished themselves as artists and educators. Currently chair of Berklee College of Music’s String Department, Wallace previously enjoyed a fourteen-year tenure as a Juilliard professor, and seventeen years as a New York Philharmonic Teaching Artist.